Hanoi (VNA) – National Assembly deputies on November 2 began exploring the outcomes of the implementation of socio-economic development plan in 2016, the plan for 2017 and the economic restructuring plan for 2016-2020. 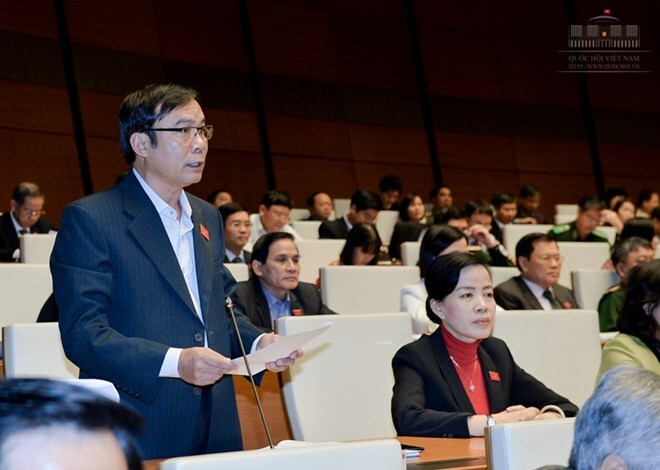 The two-day discussion, chaired by National Assembly Vice Chairman Phung Quoc Hien, was broadcast live, during which issues of interest are to be further illuminated through arguments between deputies and Cabinet members or between deputies. Many deputies agreed with the Government’s assessments of the country’s socio-economic performance in 2016 which said while numerous difficulties still remain, positive socio and economic changes were made. Deputy Nguyen Huu Cau from central Nghe An province appreciated the new Government for delivering its resolve to work harder to serve the people, and hoped that that spirit will go on well with actions in 2017 and the following years. However, many voiced their concerns about high public debts, debt repayment pressure, and inefficient State-owned enterprises. Deputy Nguyen Huu Cau proposed tightening budget disciplines and public debt management. The National Assembly should tighten the public debt cap and assign the Government to seek to curb public debts, he said. The Government asked the National Assembly to approve public debts, Government debts and national foreign debts, accounting for 65 percent, 55 percent and 50 percent, respectively, of the country’s GDP in 2017 and 2016-2020. Cau suggested public debts, Government debts and national foreign debts, not exceeding 63 percent, 50 percent and 47 percent of GDP by 2020, and asked the Government to quickly deal with five projects struggling against rising investment capital, namely Thai Nguyen iron and steel, Phuong Nam paper-pulp, Ninh Binh nitrogenous fertilizer, Dung Quat bio-energy, and Dinh Vu fibre projects, as well as individuals and organisations involved. Regarding the improvement of the business environment, many deputies shared that the Government made aggressive efforts to tackle difficulties for businesses, citing the issuance of Resolution 19 on major tasks and solutions on the work in 2016-2017 with visions towards 2020 and Resolution 35 on supporting enterprise development towards 2020 and hoped these are to create a breakthrough and a new chapter for enterprise development. However, many viewed some localities and offices did not take the creation of action plans to realise Resolution 19 and Resolution 35 seriously, seeing it as a hindrance in making the business environment better. Deputy Nguyen Ba Son from central Da Nang city proposed the Government, ministries and sectors continue screening business and investment conditions and regulations for the National Assembly to revise those that are no longer active. Besides, the private sector should have its louder voice and stronger involvement agreed in the process of making law, especially law relating to enterprises’ rights and interests, Son noted. Regional economic development and connectivity also caught interests of deputies since they viewed the issue important to spurring the national economy’s growth. The issue was early recognized by the Party and State, and has been continuously clarified through the 8 th , 9 th , 10 th , 11 th and 12 th Party Congress. Nguyen Ba Son argued that regional connectivity among some provinces and cities remains a physical connection as volunteered by localities and its long-term effects are yet secured by legal mechanisms. Key economic zones, meanwhile, failed to prove their leading role in narrowing development gaps between regions, Son noted, stressing the need for the Government to continue reforming its planning work, analyzing regional strengths, among others.